Maru is the true story of a young Latina girl, who arrives in America in search of a better life. She makes new friends and learns she is not alone on her journey. Maru and Jamie dolls come with a story book, Savannah does not. Each Maru and Friends doll celebrates the beautiful attributes and culture of little girls. Maru & Friends are 20"/52cm tall with full vinyl bodies and tilting heads. At My Doll Best Friend we also offer the Maru & Friends brand of clothing too . Although the clothing has been toy tested in USA it has not been toy tested in Europe so this is only suitable for age 14+. However, we do have clothing that fits Maru & Friends dolls and is suitable from age 3+ here. Click here for articles in connection with Maru & Friends. 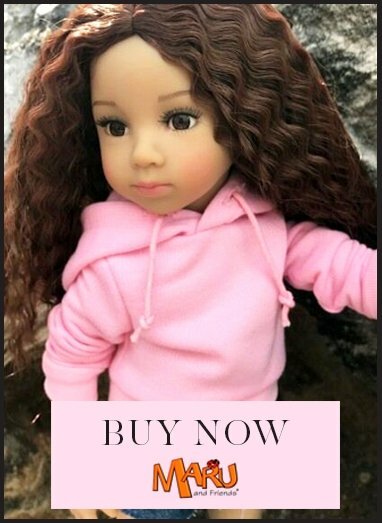 Maru & Friends NEW Limited Edition 33cm Mini Pal Tanya doll with 2 Wigs!